A top dress fertiliser that provides nitrogen and calcium and zinc nutrition for vegetables, fruits, vines, flowers, turf and ornamentals. The addition of zinc in calcium nitrate provides another essential plant nutrient. Zinc is required in small amounts but is of high importance for quality of fruit and vegetable crops. Zinc deficiency is generally associated with stunted growth and problems with normal reproduction and maturing. Applying NitroCal+Zn is part of an overall zinc strategy that helps to assure good yields. The maintenance level of zinc compliments calcium and improves cellular uptake of calcium. Like boron, zinc is also involved with strong flowering and fruit set. As zinc is a relatively immobile nutrient in the plant, applications of NitroCal+Zn throughout the growing season are an ideal fit in most fertiliser programs. 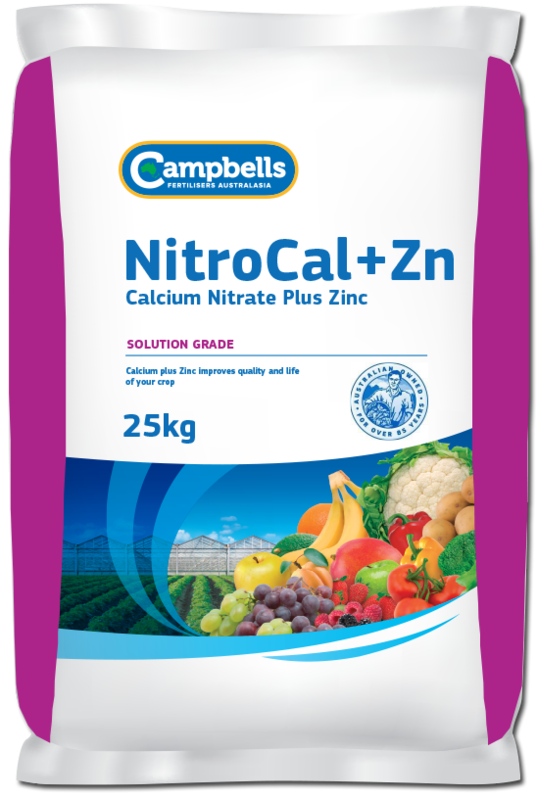 Campbells NitroCal+Zn is especially important in crops that produce seeds and nuts, due to their generally higher zinc requirement. NitroCal+Zn can be applied as a band or broadcast application or applied through the fertigation system. NitroCal+Zn is suitable for use throughout the duration of the crop, beginning during the very early stages of the season or crop development. NitroCal+Zn is also used as a post harvest application on stone fruit, pome fruit and vines, where it is important to achieve the best flower quality, fruit set and early fruitlet development the following season. General dry spread rates for horticultural crops are between 80 to 250 kg/ha as a spread application and between 25 to 70 kg/ha through fertigation. General foliar application rates are at a concentration of 0.5-1%. The actual rates, number of applications and their timing will vary considerably for different crops and for different districts. Before application, seek advice from your Campbell’s Nitrocal+Zn distributor or your local agronomist.